To be able to choose between proprietary software packages is to be able to choose your master. Freedom means not having a master. Freedom means not using proprietary software. Certainly robotics has its share of proprietary software and control systems. Each robot manufacturer markets their products based on the need for secure, proprietary and un-shared systems so that they can ensure stability and control. Whole industries have been set up to bridge those proprietary barriers so that multi-vendor solutions can happen. 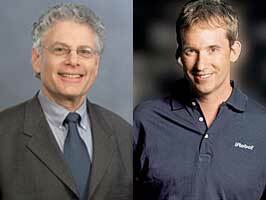 Two prominent people in the robotics industry had a discussion on the subject last year. In a spirited cocktail party debate in Lyon, France at InnoRobo 2012, an innovation forum and trade show for service robotics, Colin Angle and Robert Bauer argued their points of view. Left: Robert Bauer, Executive Director, Commercialization, Willow Garage. Right: Colin Angle, Chairman of the Board, co-founder and CEO, iRobot (NASDAQ:IRBT). Angle suggested that freely providing such a key and critical component as the robotic operating and simulation system – and the extensive libraries that go with it – as the Open Source Robotics Foundation (previously Willow Garage) does with their open source and unprotected robotic operating system (ROS) – was tantamount to letting the biggest consumer giant(s) gobble up any mass market applications and re-market them globally at low cost because they already have (or could easily reverse-engineer) the hardware and could produce it cheaply, the operating system was free courtesy of ROS, and the only real cost was the acquisition of the application(s). Robotics innovation represents a tremendous opportunity for economic growth akin to automobiles, aerospace and information technology. If we are to freely share our ‘intellectual capital’ on the open market we risk losing the economic engine that will advance our economies and send growth and jobs overseas. 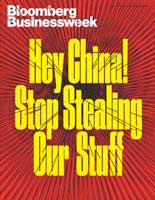 Cover of 3/19/2012 issue of Bloomberg Businessweek magazine. In November, 14 U.S. intelligence agencies issued a report describing a far-reaching industrial espionage campaign by Chinese spy agencies. This campaign has been in the works for years and targets a swath of industries: biotechnology, telecommunications, and nanotechnology, as well as clean energy. “It’s the greatest transfer of wealth in history,” said General Keith Alexander, director of the National Security Agency. Bauer said that Willow Garage’s objectives with ROS was to stimulate the industry by enabling participants to not have to reinvent the many cross-science elements of robotics ventures; to reuse software because it saves developer time and allows researchers to focus on research. By giving them free access to the tools, libraries and simulation capabilities of ROS, and access to the PR2s that are available for testing and experimentation, Willow Garage hoped to advance the state-of-the-art in autonomous robotics technologies. Bauer also said that, once a successful app was developed, at that point the new endeavor would likely lock down the operating system and application software in order to protect their invention. Angle suggested that what the robotic industry needs for inspiration is successful robotics companies – profitable companies with millionaire employees selling in-demand products; not more notches on the oversized belts of big offshore conglomerates. Further, he said that unless ROS is protected and made stable and secure, it could never be used for sensitive (defense, space, security) solutions, and until it became rugged, secure and stable, it could never be used in factories, which cannot afford down time from either their robots or software. Willow Garage has transitioned ROS to two different non-profit foundations to continue development of ROS and ROS-Industrial: The Open Source Robotics Foundation and the ROSIndustrial.org. ROS-Industrial is a new effort to enable closed industrial systems to at least have a “front end” to make available the introduction of new sensors, make robot programing and simulation easier, and take advantage of the wealth of new talent exposed to ROS in academia. Start-up companies selling co-robots are using ROS and beginning to share application software. Danish Universal Robots and Rod Brooks’ Rethink Robotics both use ROS for software development but not for control systems. Rethink Robotics plans to offer an SDK capability with an app store for robotics applications shared by other Baxter users sometime in 2014. The SDK is already available in the academic version of Baxter. Industrial robot makers are beginning to provide ROS-like capabilities in the form of updated software and simulation suites, e.g., ABB Robotics recently introduced RobotStudio which is a GIS interface to ABB’s proprietary internals for robot simulation and programming. Thus as the debate rages on, so too do the very pragmatic solutions that are necessary to make things move forward and work. The best solutions often involve multiple vendors. Look at the Tesla factory. Integrating their software and control systems into the larger manufacturing system, or even between different systems on a line, involves serious and talented programming — a process that everyone agrees needs to be simplified and made less costly. ROS-like products are fine for development and simulation, and because they are prevalent in most of academia, new hires are familiar with what it does and how it works. But that’s when those new hires are confronted with the complexities of proprietary software and teaching pendants. I’ve heard it said that it’s like going back to the mainframe era of computing. At the least, it involves learning old-style coding languages. Most of the big robot manufacturers are beginning to make an effort to improve their training and programming methods, to get them onto more practical tablets, and to provide offline simulation. But the going is slow, hence the argument for open source rages on. The truth appears to be in the middle: older systems need to be updated and yet still retain their proprietary nature. Mix and match between vendors is a fact of life and needs to be accommodated either by the use of ROS-Industrial or by the robot manufacturers themselves in the form of a new set of standards and interfaces.